Apple going up against Spotify and Rdio with new streaming service? Apple’s WWDC conference 2015 is just a few months away, and already we are receiving a plausible rumor that the tech giant is planning to launch its own music streaming service at the event to complement what it already offers to music lovers out there, the Beats audio product. As of this time there’s hardly any word from Apple about the rumored plan, but we know for a fact that the Cupertino company has been mulling to introduce its own streaming service in light of the success that Spotify and Rdio, two leading players in this market, have achieved. If confirmed, tech pundits expect the said streaming service to be integrated with the iTunes and Beats, Apple’s powerhouse in music service. It isn’t sure yet what Apple will call the rumored service, but details on how it works can be glimpsed from the new streams of reports coming in. It is likely that users will be able to access music through the platform in a broad library that is said to be pre-curated by Beats and also from the user’s own library of music that is stored in the cloud. In the early days before Apple acquired Beats, the audio service’s founders had already reached an agreement with several label companies, thus its treasure trove of a wide variety of songs that continue to grow at present. Reports also say Apple will require users to enter their iTunes/Apple ID combined with their Beats credentials to be able to access the music streaming service. In terms of the service’s logo design, some expect that Apple will create an entirely look for it, veering away from any feel of a Beats or iTunes appearance. Instead, Apple is expected to take a bit of inspiration from its own logo’s color combination and brand. However, there’s still the presence of Beats under some shade, as the technology for the rumored service is likely to be sourced from Beats. How much will it cost? According to early estimates, the price tag could play around nearly $8, much cheaper compared to Spotify’s almost $10 offering. That is one factor with which Apple hopes to bring in or poach users from its competitors. And it looks like Apple is hammering away at some more music service, leveraging its existing resources for innovative products. Some tech pundits predict that Beats at some time in the future will vanish to give way to new offerings. 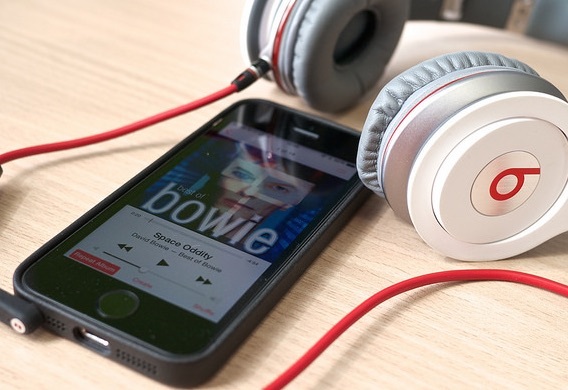 For example, rumors had it that the Music app for the Apple devices will be overhauled with all the features that originated from the creation of Beats. More then will be revealed at the 2015 WWDC conference in June.